Dèvè; an arrondissement in the Kouffo department of Benin. It is an administrative division under the jurisdiction of the commune of Dogbo, West Africa. I am fairly certain that you did not believe these “towns” existed before you read their names in this post. It is impossible to believe in something if you don’t know about it. Do you have another reason for your non-belief? Of course not. Not having knowledge of something is certainly reason enough to not believe in it. But you will notice that you did not believe they did not exist. You could not have, again, because you had no knowledge of it. Not believing something is not the same as believing the opposite. You can believe neither, as you did with regards to the existence of the 3 “towns” above and you do so all the time. Do you believe that the desk I am sitting at right now is white? Do you believe that it is not white? Do you believe I like Thai food? Do you believe I hate Thai food? But there is a difference between beliefs in specific well defined things, like a particular city or country, and a belief in vague generalities, like the many and varied gods. Atheism is non belief in any god. The main thrust of Andy’s argument during the chapter is that atheists are certainly busy people, and why should there be so much activity if atheism is just a lack of something. Andy Bannister: 1. Lack of belief cannot cause action in people, only positive beliefs cause action. 2. Atheists are busy people, writing, tweeting, arguing with Christians, etc. Therefore atheism must be a positive belief. Me: Even assuming you could prove the negative that starts point 1, point 2 needs to show an action of an atheist caused by his lack of belief in a god, and not an ancillary positive belief, before you can claim your conclusion. The difference between not believing in Sweden and not believing in the 3 towns I mentioned, is that there are ancillary positive beliefs attached to a disbelief in Sweden. And these are obvious things that will have occurred to you if you have ever spoken to someone who does not believe man has landed on the moon or does not believe that the world is a globe. Namely it is the positive belief that people have lied, or at the very least are mistaken, about things they believe. Whilst you can not believe in Shimarano, Coldier & Dèvè with no trouble, if you choose to not believe in Sweden, you must also have some positive beliefs along the lines of a grand deception being perpetuated against the world. In short, how did someone plant all this evidence for this false belief, and somewhat more importantly, why? However, there is no evidence for a god. 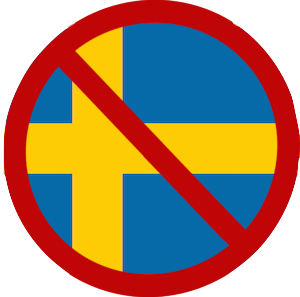 So not believing in god is entirely dissimilar to not believing in Sweden and much more like not believing in Shimarano, Coldier or Dèvè. Some of the Christians amongst you will start to protest at this point, exclaiming there is plenty of evidence for God. But as Andy Bannister himself points out in this chapter, we are not arguing about the evidence in this chapter, but rather “Can you claim atheism is simply a lack of belief?” His mistake in the rest of the chapter is that he makes atheism the motivation for everything an atheist does, and thus claims that it must be a positive belief if it is a motivating force. Actually, he doesn’t even make that steadfast a claim. His actual words are far more wishy washy: “… as far as I can make out, I think my atheist friends are claiming …“, “Actions, I presume, caused by their atheism.“, “Presumably, it was his atheism.” And as the saying goes, when you ‘presume’ you make a Pres out of U and Me. Let’s have a quick run through some of the arguments in this chapter. Andy: Atheism proves too much. Potatoes, the colour green and small rocks also don’t believe in god. Are they atheist? Me: They cannot see, run or process the sugars found in milk. Does this make them blind, lazy and lactose intolerant? Andy: A lack of belief cannot be true or false, right or wrong. Atheists do not have a stake in the conversation. Me: Correct. We do not start the conversation with a claim. But we can examine the evidence theists bring to the table, and that is generally what we do. Andy: Beliefs attract other beliefs to it (“I believe being a good Cellist takes practice.”, adds the beliefs, “I should set aside time each day to practice.”, “I should save money for Cello lessons.”, etc) and non-beliefs don’t. Atheism is attracted to Naturalism and Scientism and must therefore be a belief. Me: You have used your preferred conclusion to warrant your argument. You want atheism to be a belief, and so have started with the claim that only beliefs attract other beliefs. This is either the “Begging the Question” fallacy or plain old circular logic. Andy: Only beliefs are used as identity markers. “I am a Christian.” I am Democrat.” I am a Manchester United Fan.” Using “atheism” as an identity marker proves it is a belief. Me: Again, you are making an unwarranted assertion there about identity markers. “I am a skeptic” is an oft used identity marker, and it is rooted in the premise of non-belief without good evidence. There are, of course, positive beliefs attached to almost all non-beliefs, which I think is part of Andy Bannisters motivation in this chapter, but also the basis of his confusion. As a Christian, he believes he has good reasons to believe in God, and the life, death and resurrection of Jesus Christ. As an atheist, I believe he is mistaken about how good his reasons are. This is the real positive belief that he argues for in this chapter. He mistakingly tries to change our position from, “Andy is wrong about the evidence for God.” into “The opposite of Andys belief must be true.” At the risk of repeating myself, believing that Andy does not have good evidence that God exists is not the same as me having good evidence that no god exists. And the capitalisation I used in the last sentence explains another problem with Andy’s POV. He is approaching his Theism with regards to only one god. But as an atheist, I am looking at the possibility of all possible gods, including those I have not even heard of. I can positively believe that the Christian God does not exist, because of the contradictions in the bible; the perfect creation of the world, man’s fall, salvation through Christ’s resurrection and the impossibility of human free will. The story does not make sense and is incompatible with what I know of the universe and our place in it. But this by itself does not make me an atheist. My positive belief that his particular idea of God does not exist is just one blip in an infinitely large spectrum of gods. Leaving aside the fact that Christians don’t agree on the idea of God, we then have any other number of religions that are expressed by people alive or dead. And then there are an infinite number of god concepts that have not been expressed by anyone. I cannot positively believe that none of these gods has ever, or will ever exist. But I can positively not believe in them without the evidence. Andy Bannister brings up a point about active and passive beliefs or non-beliefs in the chapter. It’s a slightly confusing section where he mixes mention of beliefs and non-beliefs, but I will quote him below. Do you believe in Sweden? One last thing struck me about this chapter, and the existence of countries and cities. Of the three small “towns” I mentioned at the top, only two of them are real, found by scrolling through Google Earth. The other is a complete fabrication. Initially I was going to get you to examine how beliefs (and non-beliefs) were affected when you knew that one of them definitely didn’t exist. But another thought occurred to me after creating this place entirely in my own mind. And it was that the other two were also created in someones mind. And so was Sweden. Sweden does not exist as a physical thing. And by that I mean, it was not found as a real place by someone out hiking one day. It was imagined initially by one person, and then that idea was shared with another, until enough people agreed with the parameters of it. Someone was the first person to give it the name, Sweden. It was a name that s/he created in his/her mind and after sharing it around it was agreed that it would be called Sweden. The borders on the map that tell us where Sweden is in the real world are purely arbitrary marks. They were first thought up by someone, and probably after arguments and discussions about where they should actually go, the rest of the world agreed on Swedens location. The flag, was first seen by one person, who drew it and made it into a reality, and after a discussion or vote, it was made the official flag. The currency, the language, the government; all the things that make Sweden, Sweden, are fictions created from the imagination of wo/man. When enough of us agree that these fictions should be treated as fact, then we do. It becomes somewhat real in our collective psyche. But Sweden only “exists” as long as man does. It wasn’t here before us and it won’t be here when we are gone. It is interesting that Andy Bannister questioned a belief that is wholly an invention of the human mind in a chapter examining the non-belief of god.